As you know, one of the main Waldorf teaching methods is the sharing and retelling of stories. It’s one of the many beautiful foundational pieces that comes to life on the pages of the main lesson books. 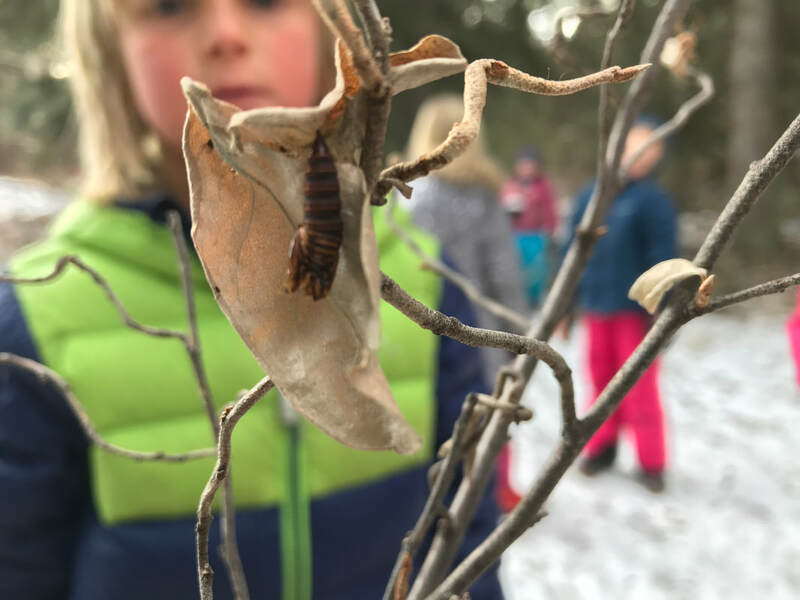 Nature stories are a big element of our outdoor learning time, as well. 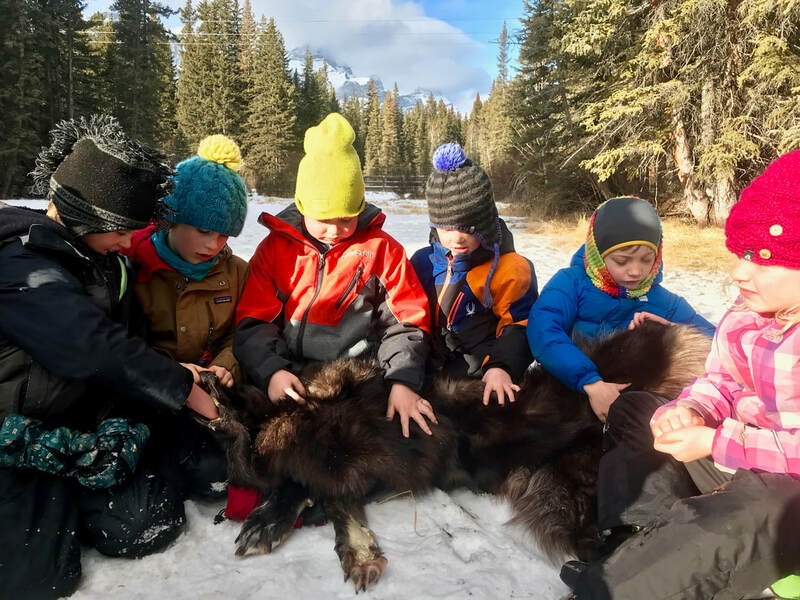 This month, stories really anchored our nature immersion and they unfolded in many different ways, reinforcing their teaching and learning importance. 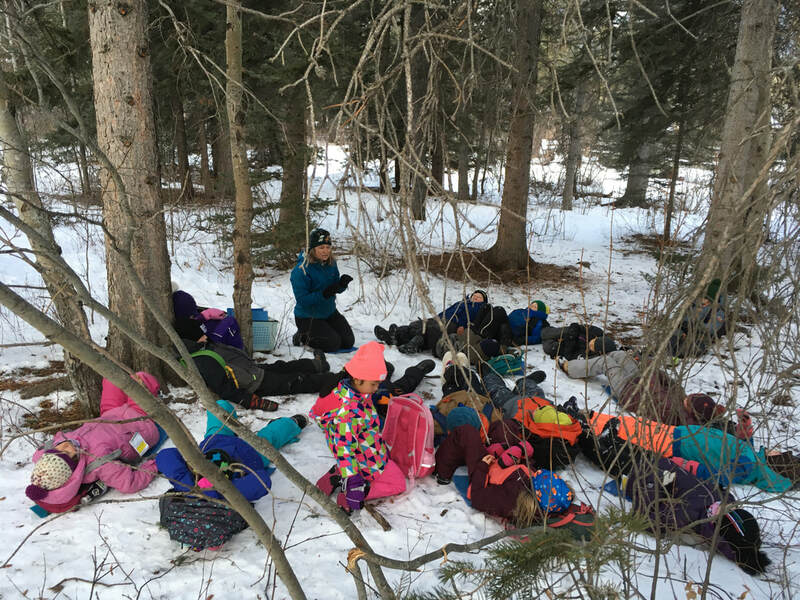 The Grade 2/3 class heard an oral story while lying in the forest. They were studying ‘hearing and sound’ and our plan was to explore how animals rely on this sense to survive. The story was about a pair of bats on migration - it profiled bat species, the difficulties they face during migration, and how they use echolocation to communicate. The story was followed up with a game where one partner needed to verbally guide their blindfolded partner through a migration route while avoiding all the obstacles and hazards. Stories are relevant and informative. During the science experiment afternoons, the Grade 1’s and 2’s physically acted out a story on the water cycle. They followed a single water droplet through the cycle and they literally rained down on the landscape, fell on the backs of animals, collected in ponds, and evaporated back up into the clouds. Stories are playful. 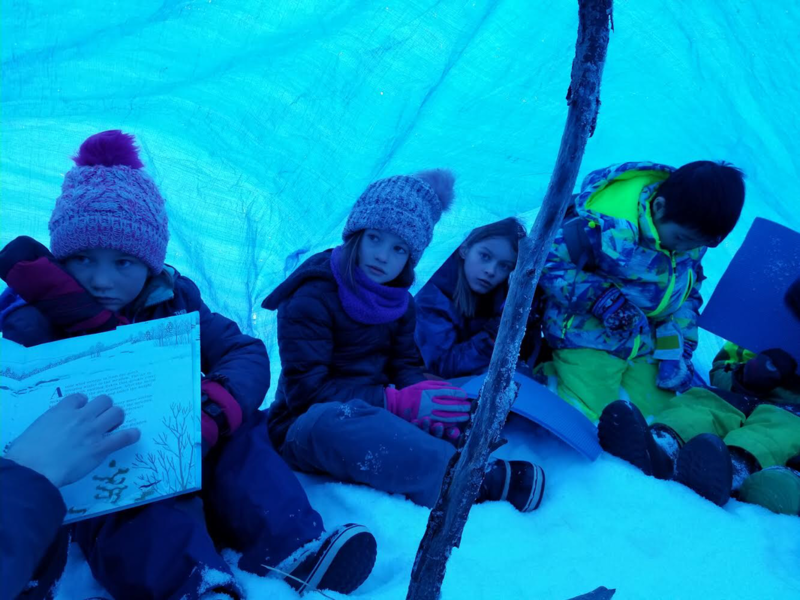 The Grade 3/4 class were read a storybook while tucked in together under a large tarp (which represented life under the snow, of course). 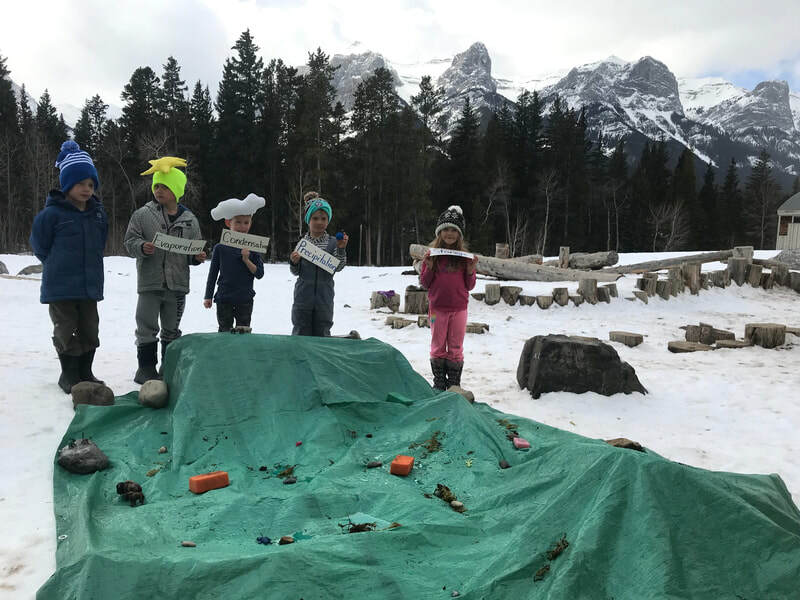 This class started their unit on ‘life cycles’ (Gr 3) and ‘plants’ (Gr 4) so we wanted to discover how they survived the winter months as we move into spring. The story gave us good information and photos about how difficult the winter world is, right under our feet. We felt our bodies heat up under the tarp while the story was being read. We then played a game of predator / prey where we were snow fleas, spiders, shrews, and our top predator, the weasel. Stories are heard but also felt. Our Kindergarten and Grade 1/2 class met Lady Spring, in all her spring glory, on March 20th. She was sitting in the forest awaiting their arrival and told a detailed story in character about her arguments with grumpy old man winter. He really did a number on us last month and Lady Spring was convincing him to loosen his hold and let spring arrive. 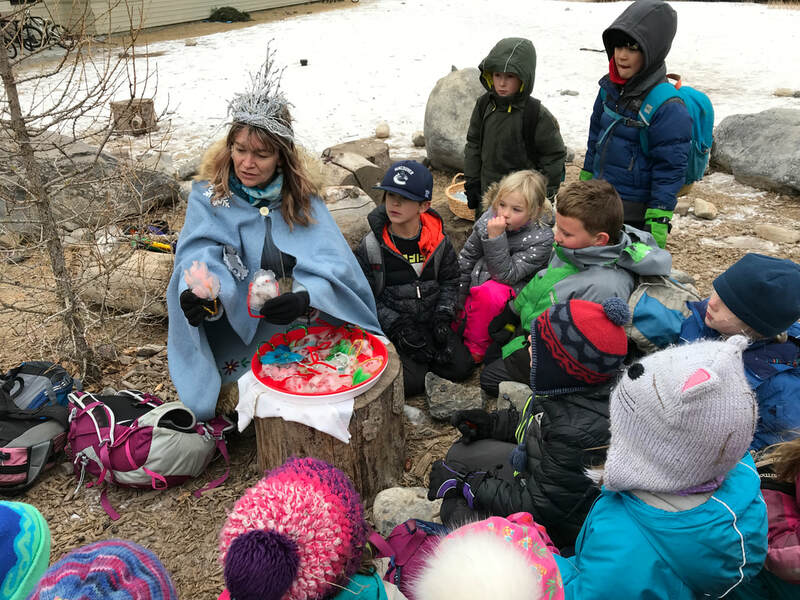 In the end, the children were issued an important challenge to find the first signs of spring, using all their senses, in order to prove to old man winter that they had the skills to mark and celebrate the changing of the seasons. Stories are engaging and magical. Finally, the Frade 3/4 class were retold a gifted Blackfoot story about the arrival of the first prairie crocus. Unfortunately, we didn’t actually find the flower on this day, but my hope is when they do, they will have a deeper appreciation for its significance. Perhaps, they’ll even feel inspired to share the story too! Stories live in place and come from the land. 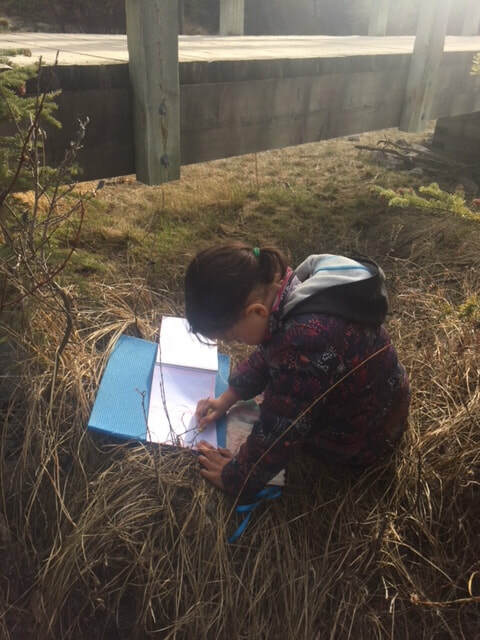 One of my favourite nature activities to do with students has to be exploring nature with maps, designing our own maps, and orienteering. This month the Grade 5/6 class did an orienteering course and mapping exercise through the Alpenglow forest and Lions Park. We were integrating their math geometry block into this outdoor learning experience. We (Ms.Erica and I) expected these students to excel at this task. They are a fit group of kids, they are excited about taking on independent challenges, and they know this area exceptionally well. What I didn’t expect, is to hear first hand, just how strongly connected they are to this learning place. 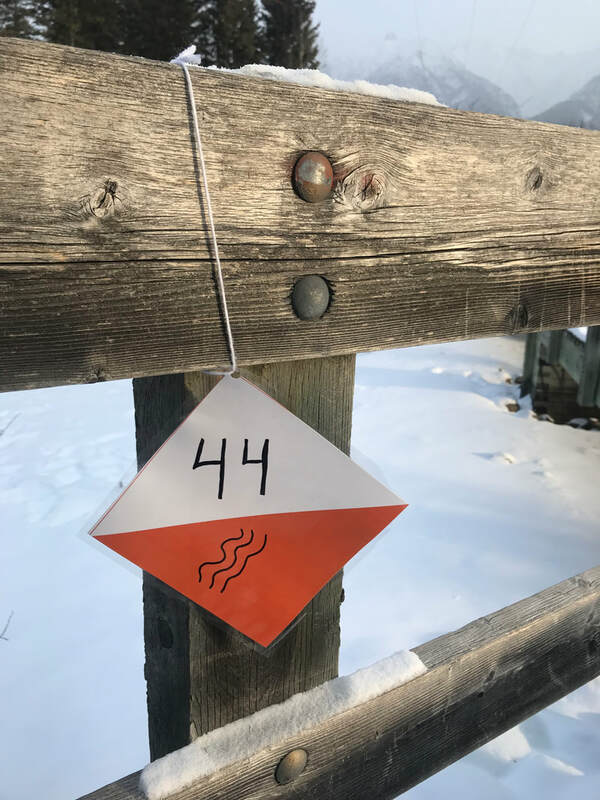 The orienteering course was designed to take them to 5 stations and each pair of students had different markers they had to find and in various orders. They managed this task in record speed and found various ways in making the task even simpler by predicting what one marker must be if it needed to lead them to another (clever kids). The students were then tasked with collecting information for the design of their own maps. 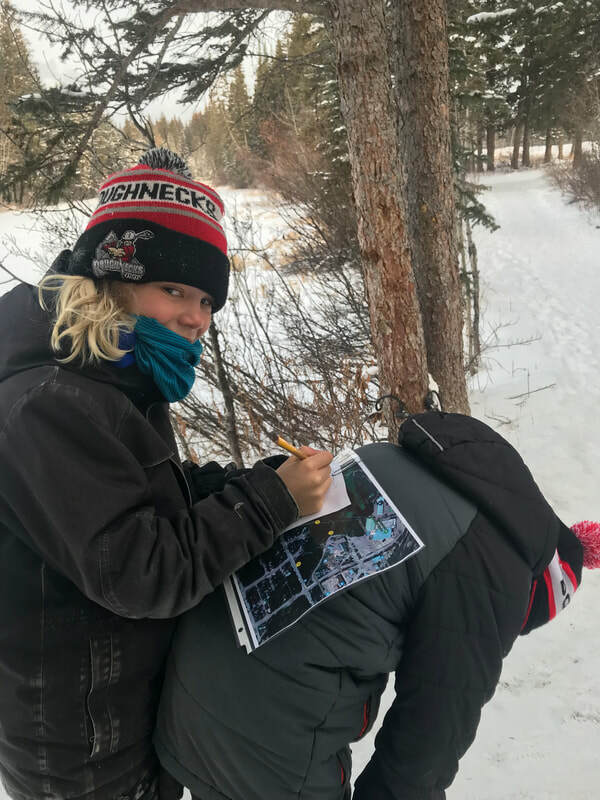 They measured the distances between markers (using different techniques), captured the height of the tallest trees using clinometres (and advanced trigonometry), and my favourite exercise, inventoried places and spaces they found worthy to put on their own map. What I learned from the student’s observations was that they have a unique and detailed knowledge of this landscape. One I don’t share, as it’s truly their space. It brought the concept of “place-based” learning to life for me and I got very excited. 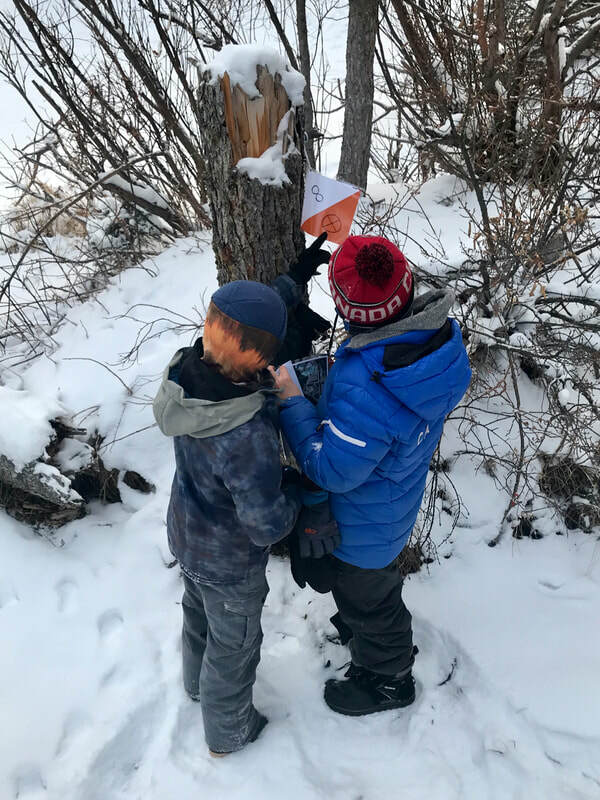 The kids shared stories of the squirrel tree, climbing tree, Hobbit hole, secret path, burly tree, tag pole, culvert area, the “creek town homes”… and the list went on. This intimate connection has obviously taken time to establish. Some of this class (the grade 6’s) produced 3D clay maps of the forest last year. They referred to this particular mapping exercise several times when they were brainstorming important features of an Alpenglow forest map. Their clay maps were still a powerful memory. Everyone shared something or somewhere they find important, to them, in the back forest. Now that’s special. It’s math, it’s science, it’s art...it’s learning in and from the land. 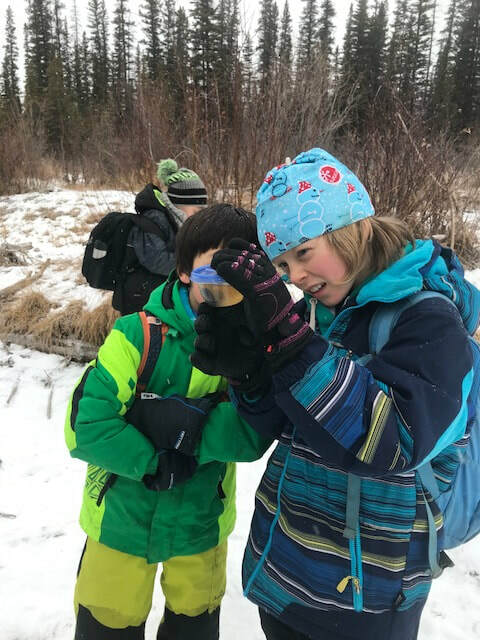 The learning continued, as the Grade 3/4 class set out to explore the rocks in our area, as they were completing that unit. They first built sedimentary rocks using their bodies and we did what they most love at this developmental stage - we made a ‘dog pile’, this allowed them to actually feel the pressure needed to create rocks and thankfully there wasn’t any dramatic folding or faulting. Then, they used their senses to identify rocks (similar to the grade 3’s last month), but this time we learned that when it’s cold and wet the limestone doesn’t respond as we expected. We then walked to the river on Larch Island to do an erosion experiment to help us better understand the power of water. 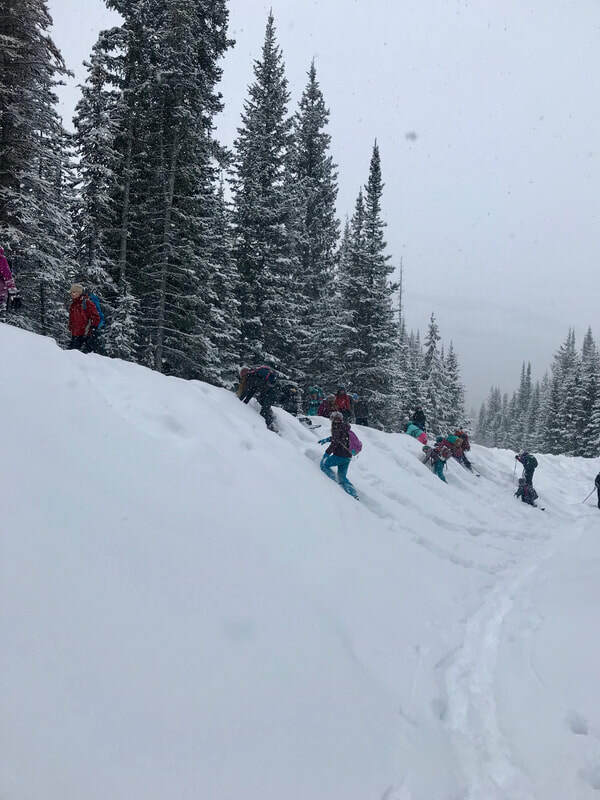 We’re all learning and getting better acquainted to this extended section of our schoolyard classroom, we’re so lucky to be so close to this trail system. The Grade 2/3 class were fully immersed in their math main lesson block so we seized the day and explored math outside all morning. It was a chilly day but we adapted by ‘adding’ a wee play at Lions Park and a brief warm-up inside. 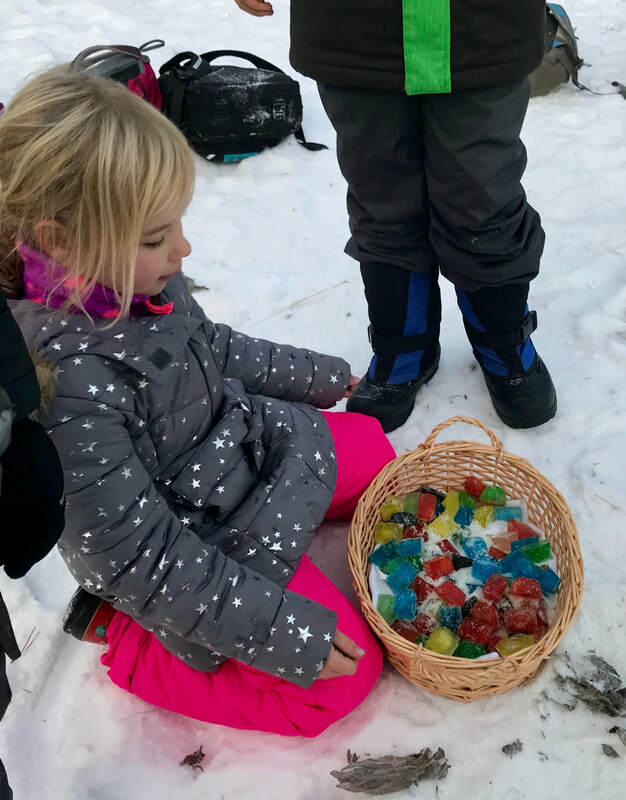 The class participated in active math stations which had them measuring, making patterns, counting in different ways, and finding numbers and shapes in nature. The best part of the day was their excitement in individually measuring everything they could, including one of the school bridges (which we learned is 32 m long, in case you were wondering). They ended their day by setting up a research plot so they could measure the snowfall this winter and hopefully, the depth of the water once spring is upon us... that’s if the post stays in the ground that long...more learning. With much gratitude I learn alongside these fantastic children! October’s weather came in like a lion but that didn’t phase our students, if anything it appeared to inspire their outdoor learning and play. Here’s a few highlights of the time spent with Alpenglow’s Nature Immersion Specialist this month. 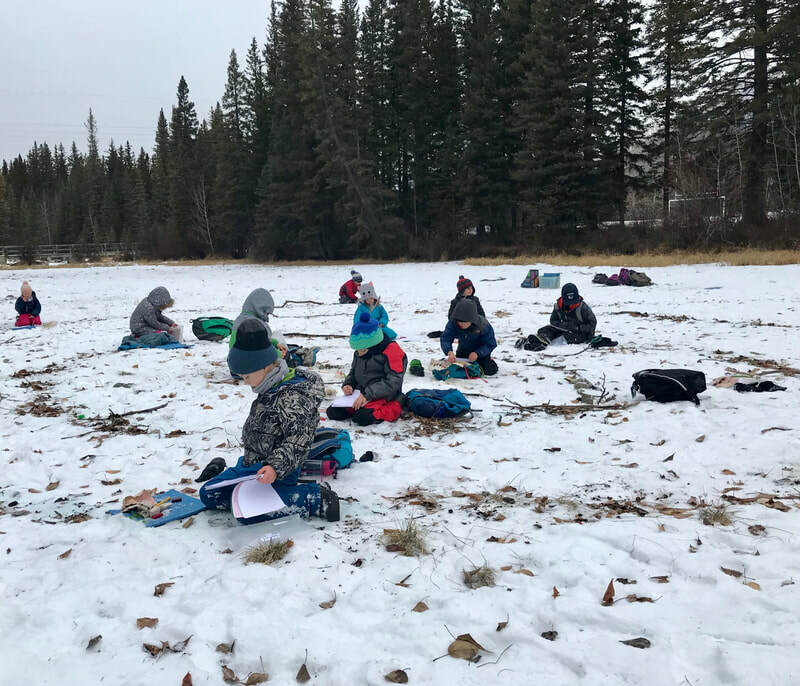 The Grade 5/6’s did a weather field study right after the big October snow storm. Like real climatologists, they captured, recorded and predicted the weather. 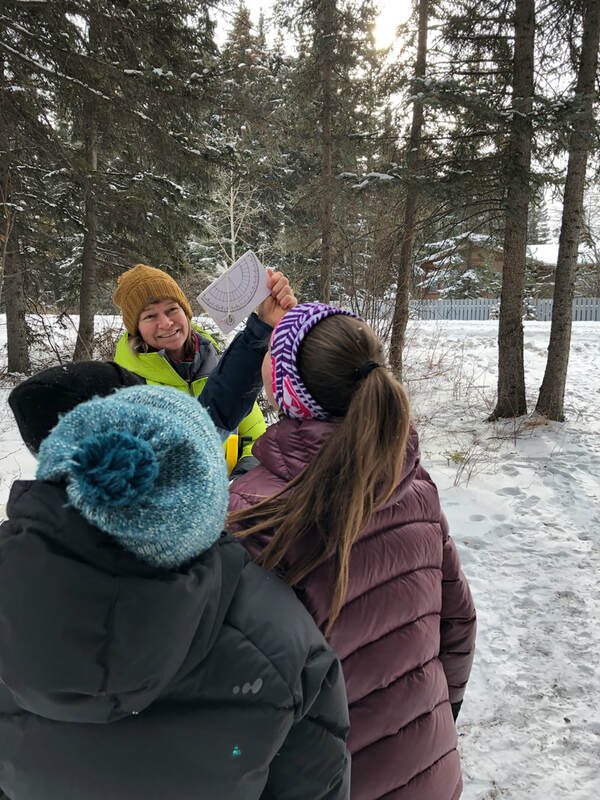 They played a rousing game of ‘capture the weather’, explored weather and climate features while hiking the Larch Island trails, and ended their morning acting out a weather play. They solidified their learning by sharing their knowledge in circle and capturing their findings with some solo field journaling time. The Grade 2/3 class hiked down to the dry creek bed past Lions Park to study our local rocks. They really enjoyed sorting the creek rocks into colours, patterns, textures, etc and recorded their favourite sorting tool into their nature journals. Then they used their senses to identify rocks using their eyes, ears, noses, and even teeth. Lastly, they created beautiful rock art and brainstormed how rocks are used in our community. The Grade 1/2 class went on a sound 'I wonder’ hike of Larch Island. 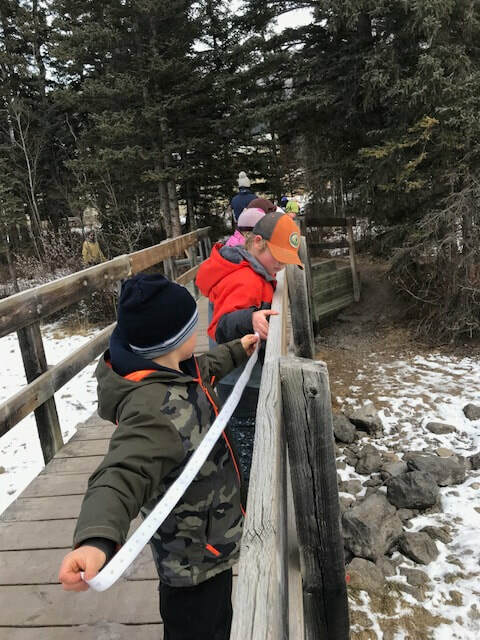 This was the first hike for many of the Grade 1’s and they did great! Thanks to the parents that attended we were able to play a couple ‘sound’ activities along the trail. They also recorded all their ‘I wonder statements’ to help them value questions during their nature exploration time. 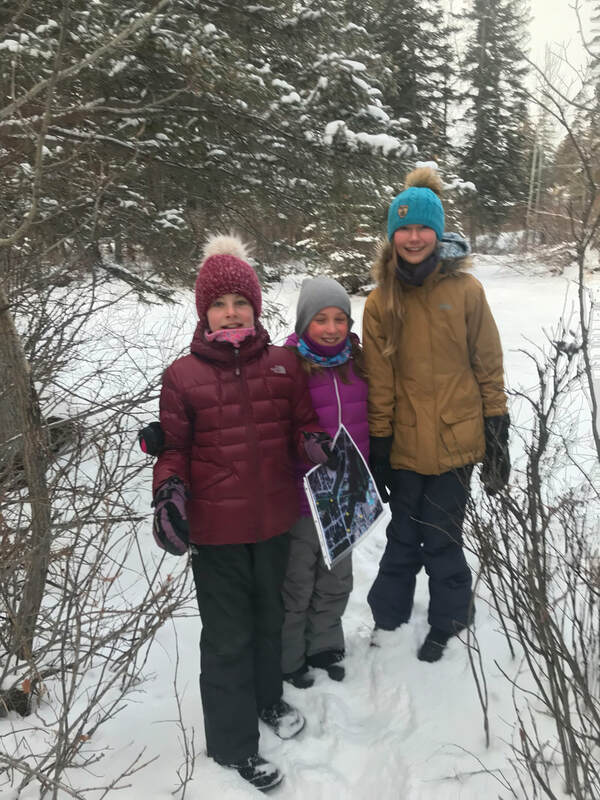 The Grade 3/4 class explored map making in the back forest. They played a big game of “map maker mayhem” which had them running to the cardinal directions and doing other crazy mapping antics. They heard a story about how 5 children received parts of a map and what it all meant. Then, they created their own treasure maps, tested them, and exchanged them with partners to find each other’s treasurers in the forest. They finished their time doing an inventory of what ‘values’ and ‘places’ they’d add to a map of the school’s forest. I am most grateful for another month learning alongside our incredible teachers and eager students. 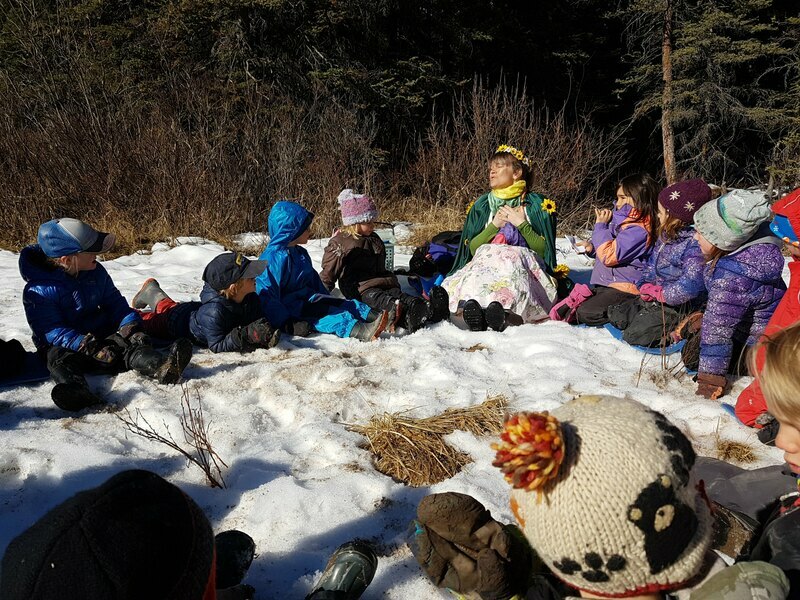 ​All the classes had a nature immersion experience with Andrea (Alpenglow School's Nature Immersion Specialist) this month. During these first outdoor excursions, nature or field journals were incorporated. No matter the age or class, it was remarkable to see the pride and care the students showed in creating their nature reflections. They captured their observations, their learning and their many wonderments while outside. These journals will be a nice addition to their main lesson books and hopefully a treasured momento to this year’s learning. The division 1 wing (Kindergarten, Grade 1/2 & Grade 2/3) also has a new weather tree. Every day, the students will record their daily weather observations by colouring a leaf. There is a leaf to mark every school day this year. However, we just didn’t expect so many ‘white’ coloured leaves this fall! 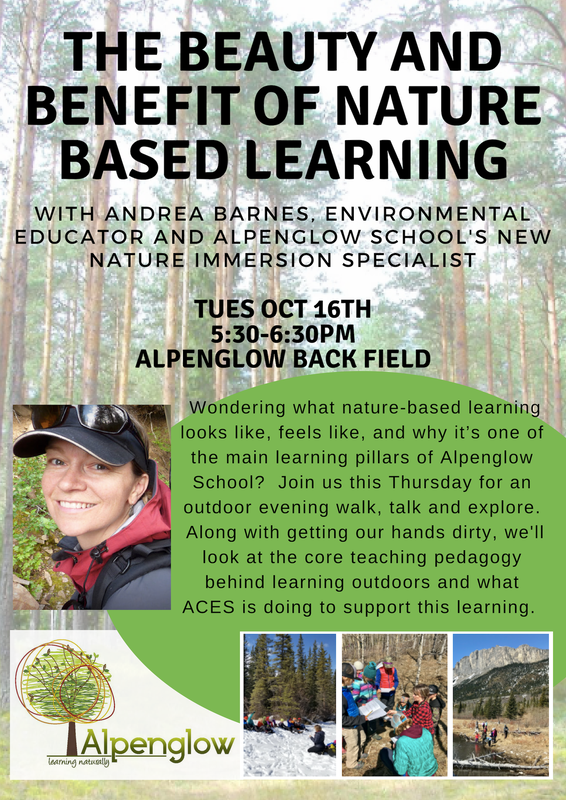 Don’t forget...if you’re interested in learning more about the school’s nature immesion program please join Andrea for an outdoor evening talk on October 16th, 5:30-6:30 pm. Meet by the fire ring behind the school.